Sheltering on the seaward side of the mountains that divide Piemonte from the coast, Liguria is the classic introduction to Italy for travelers journeying overland through France. There’s an unexpected change as you cross the border from Nice and Monaco: the Italian Riviera (as Liguria’s commercially developed strip of coast is known) has more variety of landscape and architecture than its French counterpart, and is generally less frenetic. The mountains which, in places, drop sheer to the sea are treated as an irrelevance by most visitors eager to press on to their chosen resort, but Liguria’s lofty hinterland can offer respite from the standard format of beach, beach and more beach. Teetering on slopes carpeted with olives and vines are isolated mountain villages that retain their own rural culture and cuisine. The chief city of the region is Genoa, an ancient, sprawling port often acclaimed as the most atmospheric of all Italian cities. It has a dense and fascinating old quarter that is complemented by a vibrant social and ethnic mix and a newly energized dockside district. The city stands midway between two distinct stretches of coastline. To the west is the Riviera di Ponente, one long ribbon of hotels packed out in summer with Italian families who book a year ahead to stay in their favorite spot. Picking your route carefully means you can avoid the worst of it. San Remo, the grande-dame of Riviera resorts, is flanked by hillsides covered with glasshouses, and is a major center for the worldwide export of flowers; Albenga and Noli are attractive medieval centres that have also retained a good deal of character; and Finale Ligure is a thoroughly pleasant Mediterranean seaside town. On Genoa’s eastern side is the more rugged Riviera di Levante. Umbrella pines grow horizontally on the cliff-faces overlooking the water, and in the evening a glassy calm falls over the little bays and inlets. Walks on Monte di Portofino and in the coastal scenery of the famed Cinque Terre take you through scrubland and vineyards for memorable vistas over broad gulfs and jutting headlands. This mix of mountains and fishing villages accessible only by boat appealed to the early nineteenth-century Romantics, who “discovered” the Riviera in the eighteenth century, preparing the way for other artists and poets and the first package tourists. Now the whole area explodes into quite a ruck every July and August, with resorts like Portofino qualifying as amongst the most expensive in the country – although nearby Santa Margherita Ligure has its unpretentious moments, and Levanto is a great place to make for if you just want to soak up the sun on a budget. Visiting out of season, of course, is a peaceful way to enjoy the beauty without the hubbub. In the summer months, though, the only real way to avoid the crowds is to travel inland. Minor roads and mule tracks link villages built spiral-fashion around hilltops, originally as protection against Saracen invasion. A testing long-distance footpath, the Alta Via dei Monti Liguri runs from pass to mountain pass along the length of Liguria, but aside from the odd section accessible on public transport from the coast it’s mainly for hardened pros. Nonetheless, high-altitude resorts such as Santo Stefano d’Aveto and Torriglia offer plenty of summer walking (and, in places, winter skiing) that can lift you a world away from the resorts down below on the sea. In a car, the shore road is for the most part a disappointment: the coast is extremely built up, and in fact you get a much better sense of the beauty of the region by taking the east-west autostrada which cuts through the mountains a few kilometers inland by means of a mixture of tunnels and viaducts. Fleeting bursts of daylight between tunnels give glimpses of the string of resorts along the coast, silvery olive groves and a brilliant sea. However, the easiest way to take in the region is by train: there are regular services stopping just about everywhere and, because the track is forced to squeeze along the narrow coastal strip, stations are invariably centrally located in towns and villages. 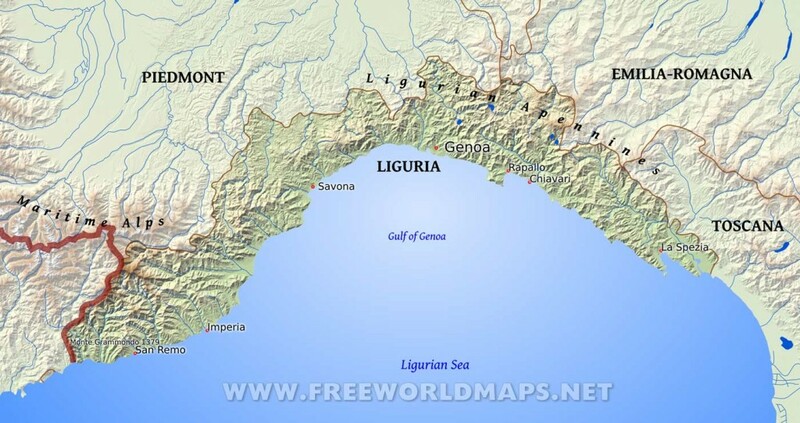 The only in-depth guide to Liguria, a mountainous region of dizzy passes and breath-taking views. The narrow strip of coast includes gems such as the Italian Riviera, the port city of Genoa, the glitzy resort of Portofino and the Cinque Terra. With a strong regional identity, the spectacular scenery, the mediaeval towns, fishing ports and food have attracted some of the world’s most famous writers. This is the only guide with a detailed description of the mountains and hilltop villages. Colorful extras like Italian proverbs and simple recipes are scattered throughout.